This time, surveillance video released last week from a Chicago high school contradicts earlier CPD statements that they were provoked to punch and use a stun gun on a 16-year-old student. 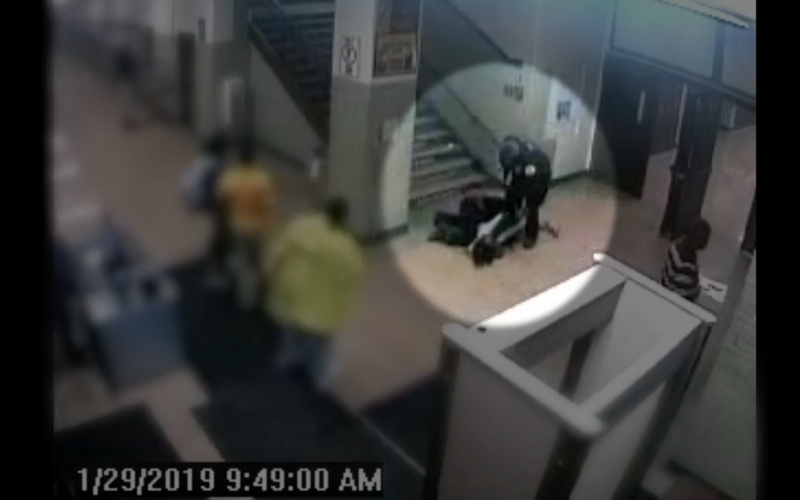 The video, obtained by the Chicago Sun-Times on April 12, shows Chicago police pushing Dnigma Howard, a student at Marshall High School, and dragging her down the school’s stairwell. Shot by a school security camera, the footage also shows the two school resource officers, Johnnie Pierre and Sherry Trip, punching and stunning Dnigma with a Taser. The video confirms Dnigma’s claims that she was attacked unprovoked by police, who earlier reported they were acting in self defense. In a police report detailing the Jan. 29 incident, which allegedly stemmed from Dnigma getting kicked out of class for not putting her cell phone away, officers Pierre and Trip claimed Dnigma “became irate and initiated a physical altercation with the officers.” According to the report, Dnigma’s attempts to fight officers off caused all three to fall down a flight of stairs. But Dnigma has disputed that claim since the beginning, saying that she was pushed down the stairs and grabbed an officer’s vest as she was falling. If anything, what the video shows is even worse than what Dnigma first described, with one of the officers dragging her down the stairs by one leg. As they stomp and punch Dnigma, students can be seen looking on. The violent confrontation between the officers and Dnigma also happened right in front of the girl’s father, Laurentio Howard, who had gone to the school to pick up his daughter. In another interview with Chicago ABC affiliate WLS TV, Howard laid out what was going through his mind as he saw officers beating his child in front of him. The lawyer representing Dnigma’s family in a federal lawsuit against the city accused officers Pierre and Trip with making a false statement. The new video—and the gulf between what it shows and what Chicago police said happened—has further enflamed a long-burning issue in the Windy City: the extent to which Chicago police officers actually protect the students they’re charged with keeping safe. A 2017 report found CPD school police officers lacked proper training and had little oversight, according to the Chicago Tribune. On top of that, the city was forced to pay out more than $2 million in misconduct settlements involving CPD school resource officers between 2012 and 2016 alone. Earlier cellphone footage of the arrest was enough to stir outrage and have the officers removed from Marshall High School; however, both continue to work for district in other capacities. Following the brutal arrest, Dnigma was charged with two felony counts of aggravated battery. Prosecutors later dropped the charges against her. On the same day the new surveillance video was released, Stroth filed an amended lawsuit on behalf of Dnigma and her family against the city, the Board of Education, and the two officers for violating Dnigma’s civil rights. He also called on Mayor-elect Lori Lightfoot to address the issue of CPD presence in the city’s public schools. Body cam footage from the incident has yet to be released.